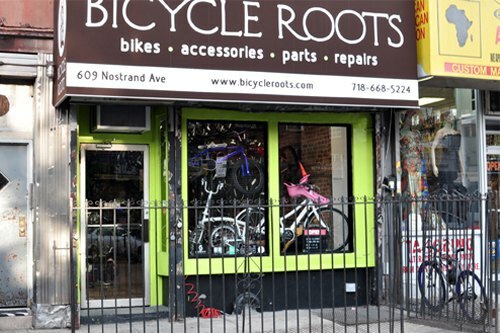 Bicycle Roots, a full service bike shop located on Nostrand Avenue in Crown Heights, recently relocated from their former spot on Fulton. 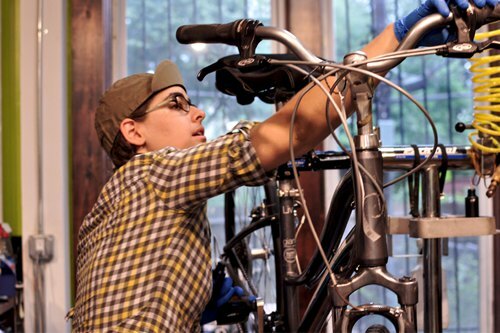 The shop is run by Nechama Levy and Joe Lawler, both New York City natives and very experienced and enthusiastic cyclists. Nechama grew up in Queens as an ultra-Orthodox Jew, but abandoned that lifestyle in the early 2000s and turned to cycling at full speed. Joe grew up in Hell's Kitchen, near the cycling mecca known as Central Park, and currently holds the title of Tandem Cyclocross World Champion. The shop's story is so unique and inspiring that I had to get on my own two wheels and venture past our Bushwick borders to talk to Nechama and see the shop firsthand. BD: How and when did you get into biking? Nechama: I was always into biking, I never stopped biking as a kid. I grew up in Queens and never had a car. I started biking in New York City for transportation after the transit strike, which was the winter of 2005. 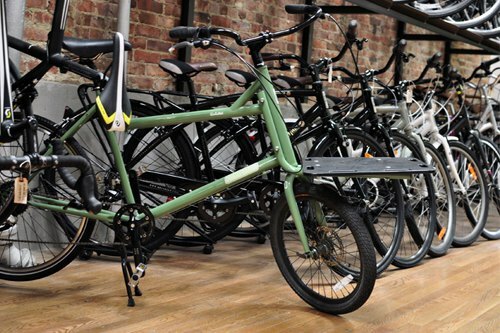 I was living in Harlem and commuting to the Bronx for work by train, and when there were no trains, I was being carpooled up there but the traffic was horrible and I was dependent on my boss taking me to work, so I bought a bicycle from Recycle a Bicycle. I wanted a blue bike, that's how little I knew about bikes at the time. But I fell in love with it, and I remember shouldering my bike over the bridge through the snow. BD: Bicycle Roots was in another space before this one? Nechama: Yeah, we were in another location on Fulton Street last summer and it just wasn't a good space for us for various reasons, so we closed and didn't have a space for a little while. We found this location, started renovations on April 1st, and opened officially in June. BD: And why specifically Crown Heights? Nechama: The neighborhood really needed a bike shop. There was one a block away from here, but it closed like twenty years ago, the owner just retired, so there was a gaping hole since then. There's a ton of cyclists in the neighborhood and this is sort of a cycling thoroughfare because we're between Dean and Bergen and those are the main East-West bike routes in Brooklyn. People really depend on bicycles for transportation and there's a strong culture of racers and performance riders. Since we've opened, many riders have told us how convenient the location is, and how they had been going to Bed-Stuy or downtown Manhattan for their cycling needs. BD: In the shop's press release, there's a mention of a biking accident you were involved in. Can you talk about how that affected your career? Nechama: Yeah I was run over by a garbage truck, and that was sort of what triggered a change in careers for me. I was a medical technician, and once I recovered from the accident, I decided to become a bicycle mechanic. The truck ran over my feet, and I did recover because of the type of injury and the way that your feet are able to sustain that kind of injury. BD: And why did this situation really solidify that switch from medical work to bicycle work? Nechama: Well I realized at work as a medical technician that I was wasting a lot of time just reading about bikes. After the accident, I was in a wheelchair, and I was trying to do my job but the hospital was not very wheelchair accessible. A lot of my work consisted of getting things, and suddenly these simple tasks became so difficult. I was in a union that would've given me a job that I could've done better, but to me the job seemed sort of pointless... academic medical research has its own niche that just wasn't doing it for me. A lot of energy is spent researching things that never could possibly succeed, and I felt like the project I was working on was doomed to failure. 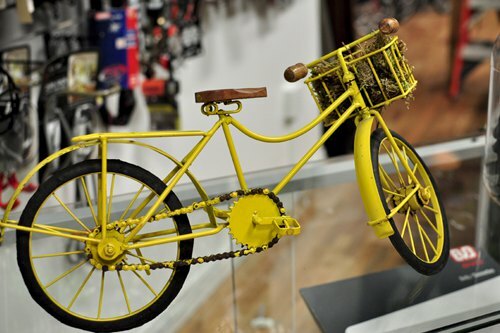 I quit my job, tried to get a job as a bicycle mechanic but I couldn't because I didn't have any hands-on experience, then I went to a three-week bicycle mechanic school at the United Bicycle Institute in Oregon. I came back to New York City, got a job that day at Gotham Bikes, and the rest is history. BD: And how'd you team up with Joe? Nechama: He and I are the same age, and though this is my second career, being a bicycle mechanic is his first career. He's been doing it since high school. He left his job at Sid's about a year ago, and I was hiring at the Fulton Street shop, so I hired him as a service manager. When we decided to relocate, we became business partners to operate this store together. BD: Do you get a broad range of cyclists in the shop? Nechama: Oh yeah definitely, we get all kinds of people. There are bicycle commuters, new riders, and racers. We get a lot of beginners, which are really fun because they always think they aren't capable of doing as much as they are. I also give riding lessons to adults which is great. We also sponsor three race teams, one called the Fifth Floor which is multidisciplinary, we sponsor another team called Arc Racing, and our shop team which is a cyclocross team. The races happen right at Prospect Park, so it's right around the corner. BD: Do you host events? Nechama: Yeah, we do host some and want to do more. We've had riding clubs that do rides that either begin or end at the shop. If anyone is doing a ride and they'd like to use the store as a meeting place, we're open to that, and sometimes offer discounts for the participants. In the winter we hope to do some clinics about basic bike skills too. You can sign up for our mailing list on our website. 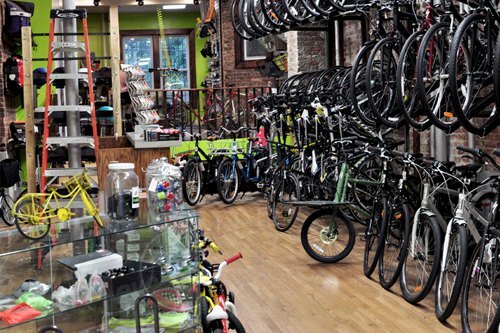 Bicycle Roots is located at 609 Nostrand Avenue between Bergen Street and Dean Street in Crown Heights. They are open Tuesday-Friday 10am-7pm, Saturday 11am-6pm, and Sunday 11am-5pm. Find them on Facebook here and twitter here. And if you're into cyclocross racing, you can pre-order the ultra rare 2014 Aluminum Crossberg by Ritte through Bicycle Roots, and have it in your hands by September.